The Modi government has challenged the Supreme Court’s order that directed the eviction of tribals and forest dwellers whose claims under the Scheduled Tribes and Other Traditional Forest Dwellers (Recognition of Forest Rights) Act, 2006 were rejected.The Court had, on February 13, directed the eviction of forest dwelling Scheduled Tribes (FDSTs) and other traditional forest dwellers (OTFDs) from 21 states. That this application for modification comes from the Centre barely 14 days after the SC’s infamous directive is not insignificant in election season. While seeking a modification of this order, the application filed through the Union Ministry of Tribal Affairs defends the Forest Rights Act. Incidentally during the several hearings of the PIL filed by Wild Life Groups, the Central Government had not put up any defence of the statute. Solicitor General Tushar Mehta, appearing on behalf of the Centre as well as the State of Gujarat, mentioned the case for early hearing before Justice Arun Mishra, whose Bench had passed the eviction order.The application seeks a modification of the order, with the Centre submitting that a holistic view of the issue is being considered. The case will be taken up for hearing tomorrow. Meanwhile, Maharashtra that is a BJP-SS led government has directed the immediate eviction of tribals and other forest dwellers living on forest lands! Clearly the states under the same party as the Centre have no qualms about the criticism of the recent SC Order! In its application filed on February 27, the Centre has defended the Act, saying that it was enacted with an intent to correct the historical process by which tribal and other forest-dwelling communities in the country were alienated from their right to habitation and right to occupy and hold forest land and forest produce. It was enacted under the constitutional mandate of Article 15(4), which specifically empowers the state to provide for the advancement of any socially and educationally backward classes, the application states. The Centre also notes the lack of implementation of the Act by state governments, particularly in states hit by left-wing extremism, which have high tribal populations. The Supreme Court in 2016 had directed the state governments to furnish data regarding the number of claims rejected and the action taken after the rejection of such claims. While some states furnished data on the number of rejections, the details for the same were not provided, the Centre contends. Affected by widespread criticism and that too in election season, the Centre’s application for modification also notes that under the Act, rejection of a claim does not ipso facto lead to the eviction of a tribal.In this light, it has been prayed that the Court modifies its order dated February 13, and pass a direction urging states to file detailed affidavits regarding the procedure followed and details of the rejection of claims of FDSTs and OTFDs under the Act. It is also prayed that the eviction be withheld for the time being. 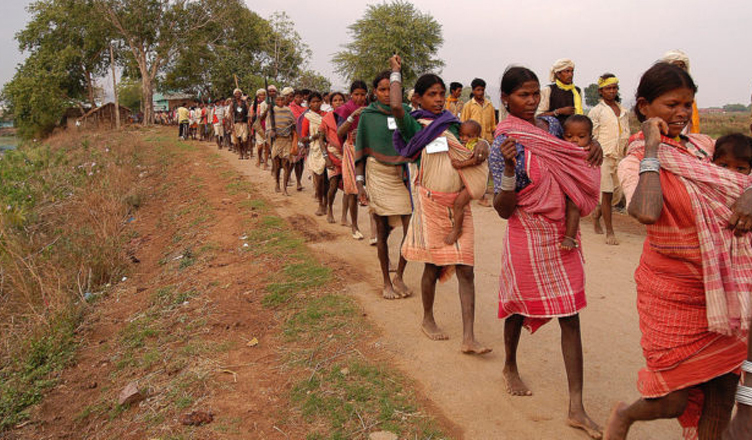 A Supreme Court bench headed by Justice Arun Mishra has ordered eviction of Adivasis and other forest dwelling communities from the ‘forest’ regions whose claims for entitlement have been rejected by the Forest department. The written copy of the order was made available on February 20, 2019. The court order says, “The Chief Secretary shall ensure that where the rejection orders have been passed, eviction will be carried out on or before the next date of hearing. In case the eviction is not carried out, as aforesaid, the matter would be viewed seriously by this Court. Let Forest Survey of India (FSI) make a satellite survey and place on record the encroachment positions and also state the positions after the eviction as far as possible. “The court asked the state governments to file affidavits by July 12, 2019.Read the entire text of the February 13 order here. In passing this much criticised order, the SC, has reversed its own established jurisprudence, and itself perpetuates this historic injustice on Adivasis.The recent SC judgment passed a few days ago by a three member bench of Arun Mishra, Navin Sinha and Indira Banerjee does just that. The central government that has been hyper active in other matters before the Supreme Court (be it triple talaq or any other) simply abdicated responsibility to defend the FRA in the Supreme Court. (iv) The Chief Secretaries should ensure that the eviction of rejected claimants is carried out. They have to file the compliance reports on or before July 24, 2019 which is next date of hearing.